Does your home have termites? Even asking that question, let alone turning to your laptop to look up “termite inspection companies near me,” may make many homeowners squeamish. Yet acknowledging the presence of termites on your property — and taking steps to eliminate their colonies as soon as possible — may mean the difference between paying several hundred dollars per year on termite treatment, or many thousands of dollars to fix the eventual damage that these pests can cause. If you see any of these signs, call Treebark, the best local termite control company in San Clemente CA. Our trained, professional technicians will schedule a home inspection — during which they will look not only for signs of termites, but also for signs of nearly two dozen other common household pests — and talk to you about your options. 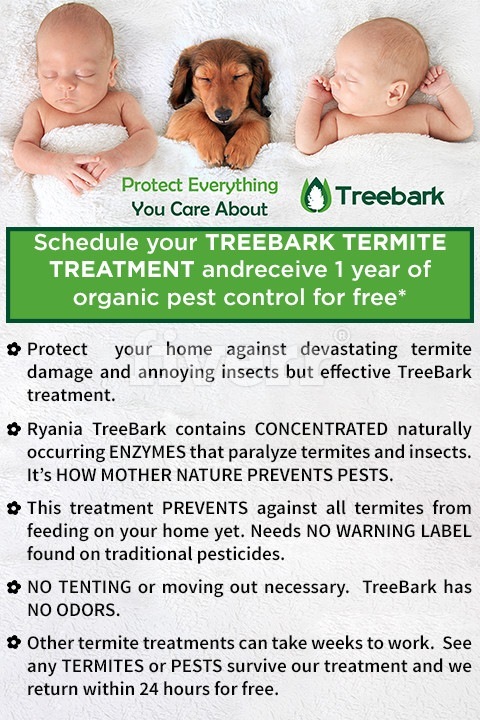 Treebark Termite and Pest Control takes an all-natural approach to pest eradication, because we believe that the safety of your family members and pets is the most important consideration in treating your home. Rather than using toxic chemical formulations to kill termites, we use a proprietary enzymatic product that is derived from the bark of a South American plant. This product is odorless and cannot be smelled or tasted by termites, so they ingest it, as well as carrying it on their bodies back to the rest of the colony. Once the termites have come into contact with TreeBark, they are doomed. They die soon afterward from paralysis, but not before spreading it to other termites. In just hours, your home will be virtually free of termites — as well as protected for up to a decade from future infestations. The Treebark techs will return within 24 hours if you happen to see any signs of pest life, and they guarantee their work for up to two years. Termite damage repair companies in San Clemente CA can charge thousands of dollars to fix the damage that has been done by termite colonies; in the meantime, you will be displaced from your home. Why not be safe and spend just a few hundred dollars per year to simply take care of the pests before they cause major problems? What about going old-school and simply blasting the suckers with poison? There are a couple of reasons that traditional chemical extermination methods should be avoided. For one thing, they require whole house tenting, which in turn necessitates evacuation of your home for several days. You would have to pack up your medicines and all the contents of your pantry to make sure the poison doesn’t get into your food. Even so, there is still a good chance that you, your children or your pets will be negatively affected by the poisonous pest control treatment. Secondly, these toxic chemicals simply don’t work as well as Mother Nature’s solution, the TreeBark compounds. Insects have plagued our earth for centuries, largely because they are highly adaptive species that develop a tolerance for whatever poisons we develop. So while blanketing your home with fumes in a scorched-earth policy may seem like the most thorough solution, chances are you’ll have to repeat the process over and over again. Not so with TreeBark — it’s a one-and-done solution to pest control. If you’re asking yourself, “Where can I find termite inspection companies near me,” the answer is simple. Call Treebark Termite and Pest Control at 1.714.406.4919 and make an appointment for a free Termite inspection and estimate. Our professional techs will visit your property and answer any questions you might have about the treatment process. As the best local termite control company in San Clemente CA, we have the experience as well as the stellar customer service to take care of your problem the right way, the first time. Termite damage repair companies in San Clemente CA do a brisk business when homeowners just like you ignore the signs of termite infestation, leading to costly and inconvenient home repairs. So don’t delay; give the professionals at Treebark a call today, or fill out our online appointment form. We will safely and effectively eliminate pests like termites from your property.